BALLYCASTLE is the most north-easterly town in Antrim, and was the landing place in early times of Scots settlers, who crossed the narrow channel between Fair Head and the Mull of Kintyre in their small flimsy boats. It is the only town of size in this part of the county, and though its connection with the sea is now a thing of the past, it is a popular and quiet holiday resort for many Irish and Scots people. The Antrim hills sweep down to magnificent cliffs on the south shore, and there is a fine stretch of moorland country on its hinterland. The Ballymena, Ballymoney, Coleraine & Portrush Junction Railway was acquired by the Belfast & Northern Counties Railway (later the Northern Counties Committee system of the L.M.S.R.) in January, 1861. This line was built to Irish standard gauge (5 ft. 3 in.) and its nearest point to Ballycastle was the market town of Ballymoney, 16 1/4 miles away. Although schemes for a railway to connect the two towns were drawn up, nothing definite was done until the Ballycastle Railway Act of 1878, with a capital of £90,000 and further borrowing powers up to £45000, was passed. The B.N.C.R., which subscribed to part of the capital, placed their manager, Mr. Cofton, in charge of the new line. There were seven directors, two of whom represented Midland Railway interests, through the medium of the B.N.C.R. A gauge of 3 ft. was adopted, though it is clear that at an earlier period the standard gauge was envisaged, as the overbridge at Ballymoney was built to those limits. The loading gauge of the railway was, in fact, 10 ft. vertically and 9 ft. horizontally, overall. At that time the 3-ft. gauge, destined to be used throughout Ireland for the narrow gauge was found only on three other systems, all of them in Antrim - the Ballymena & Larne, and Ballymena, Cushendall & Red Bay Railways; the last two were joined at Ballymena. Construction was begun by Butler and Fry, the contractors, early in 1879 and completed in September, 1880. Traffic commenced on October 19, of the latter year. The line ran through poor and bleak country, with the hills always on each side, though the scenery softened somewhat nearer Ballycastle, into which there was a steep drop from the plateau above Capecastle. To lesser undulations on the route, and to keep costs as low as possible, the gradients changed frequently. There was thus a saving in heavy earthworks, but the resultant curves were to be a source of embarrassment and expense to the company in its early years. At Capecastle, there was a short, straight tunnel, and on entering Ballycastle the line crossed the Glentow River on a stone viaduct of four arches. These two features were the only engineering works of note on the line. The summit of the railway (319 ft.) lay between Armoy and Capecastle. The narrow-gauge trains used a bay platform on the up side of the main-line station at Ballymoney. The premises, yard and workshops of The Ballycastle Railway lay to the north of the B.N.C.R. The company's offices were on the station. Round the locomotive and carriage turn-table - for such it was - the shops were arranged. There is no trace of these today. All maintenance and medium repair work was carried out there, but it is not clear whether stock was carried entire on main-line flat wagons, or partly dismantled to bring it to or from Ballymoney when necessary. It seems probable at any rate that the locomotives were erected there from parts as there were no transhipment arrangements in those days. Ballymoney Station has been entirely rebuilt during the past fifty years. At the intermediate stations of Dervock, Stranocum, Armoy, and Capecastle there was a certain amount of siding accommodation, most of which was removed under the N.C.C. regime Ballycastle Station consisted of a stone and timber structure of considerable pretentions, with arrival and departure platforms and platform awnings. There was a small three-road goods yard and a large goods shed. It was in this shed that the inevitable opening day lunch took place. There was also a small wooden shed to house one locomotive. The booking office was surmounted by a clock tower, one clock face pointing to the town, and the other down the platforms. Indeed, the whole terminus was a small but pretentious hub of traffic, and little can be judged of its early character by com-parison with what little was left after the N.C.C. had pruned it. During the 1880s there had been plans to build a railway from Portrush to Bushmills, and thence to the Ballycastle Railway at Dervock. The line which covered part of this route (the Giants Causeway Tramway) was built to the gauge of 3 ft., but was never extended to Dervock. The Ballycastle Railway was single, and divided into three sections, all worked by train staff: Ballymoney - Dervock, Dervock - Armoy, and Armoy - Ballycastle. Though there was no passing loop at Dervock, it is possible that the sections were arranged in that order to ensure maximum line capacity on fair days, which are such a feature of Irish railway traffic. Each of these stations was provided with a small signalbox and frame, similar to that remaining latterly at Ballycastle. It is probable that the Worcester firm of Dutton & Company provided all the original signalling equipment. There was also a siding between Capecastle and Ballycastle from which ballast was obtained (Ballast Pit Siding) A key on the staff unlocked these points. The railway was fully signalled. At the terminal stations, the installations were of the orthodox type, but at Stranocum, a single post with arms each side was erected in the centre of the station. At Dervock, and Armoy the signalling was identical (though the layouts were different) having a distant and home signal only for each direction of running. The railway was laid with flat-bottom rails weighing 45 lb. a yd. and spiked to wooden sleepers. These were replaced by the N.C.C. with 65 lb. rails, and spike, solepate, and bolt fastenings. The last named were more evident on curves. The N.C.C. also adopted its characteristic six-bolt "L" section fishplates. There are three very sharp curves on the line - at the Stranocum end of Dervock Station, at Chatham Hall, between the halt at Gracehill (used on market days) and Armoy, and at Ballylig, between Capecastle and Ballycastle. These curves were the cause of derailments, and during the later years of the company's independent existence the Engineer, G. T. M. Bradshaw, eased those at Ballylig (which were sharp enough to carry check rails) and Chatham Hall. Government grants made after the first world war enabled this work to be carried out. In connection with the sinuous course of the railway between Capecastle and Ballycastle it may be mentioned that this section cost as much to construct as the whole of the rest of the line. It was the practice of the permanent-way gang to re-align all sharp curves on Sundays when there were few or no trains running. No major alterations could be made to most of the sharper curves, although they were eased as funds and opportunities afforded. For the construction of the line Butler & Fry had purchased a six-coupled saddle-tank engine which was named Lady Boyd as a compliment to the first Chairman of the company, the Rev. Sir Frederick Boyd, Bart. The arms of the Boyd family were adopted by the company; the main theme was a quartered shield surmounted by a crown and fleur-de-lis, with the motto Confido beneath. The builders were Black, Hawthorn & Company (works number 573 of 1879). Work on the line proceeded satisfactorily, and in September, 1880, construction was complete. On Septem-ber 18 and 20, Colonel Rich inspected on behalf of the Board of Trade, but the first locomotive delivered, the Dalriada, was found incapable of rounding some of the sharp curves. This, and the fact that the fencing was incomplete, delayed opening for a month. Dalriada was a similar engine to Lady Boyd but larger. It came from the same makers (works number 554 of 1879) and had been borrowed by the contractors to hasten the completion of the line, a procedure to which the company could hardly object, as the contractors had advanced £400 towards the purchase. Later in the year, a second engine ordered by the company, Countess of Antrim, was delivered. It was identical with Dalriada (works number 555 of 1879), and does not appear to have been used before the opening. The makers claimed that these engines would negotiate a 500 ft.-radius curve, but the slightly longer wheelbase of the company's two engines was found excessive. Two days after the opening, the Secretary, Silis Evans, reported that two engines would be insufficient to operate the line and he was empowered to approach Butler & Fry with a view to purchasing Lody Boyd, and also to enquire the price of a new locomotive from Black Hawthorn & Company. It appears that on soliciting this enquiry as to price the company was informed that it still owed £2,290 for the two engines already delivered, and in the minutes for November, 1880, it was resolved : "That a cheque for £1,145 be sent to pay for Countess of Antrim but that payment for Dalriada be postponed until it was put into a more satisfactory condition." It is difficult at this late period to understand why a pair of identical locomotives should behave so individually but it is suggested that Dalriada was insufficiently balanced at first, which made it unsteady. In the following May (1881), nothing further having been done about the purchase of a third engine Butler & Fry offered Lady Boyd to the company for £807, but this offer was not taken up. Eventually the company hired the engine from the contractors for the summer months, the fee being one guinea a day. Within three years it had become Ballycastle Railway property outright, but the date of transfer does not appear to have been recorded. The Ballycastle engines were numbered 1 and 2, and had 13 in. x 19 in. outside cylinders, 3 ft. 3 in. driving wheels, a total heating surface of 573 sq. ft., a grate area 7 sq. ft., and 150 lb. pressure. The water capacity was 450 gallons and weight in working order 24 tons. The tractive effort was 10,500 lb. All three engines were rebuilt (so as to be almost identical) at Ballymoney in 1895. Cabs were fitted and complete new boilers were obtained from the makers. Lady Boyd had been a slightly smaller engine, and its rebuilt dimensions became: cylinders 12 in. x 19 in. ; water capacity 400 gallons, and weight in working order 22 tons. The tractive effort was 8,500 lb. The boiler was slightly shorter than that of the other engines, though its other dimensions, and the remaining dimensions of the engine itself, were the same as those of Nos. 1 and 2. At the same time, all engines received Ramsbottom valves on the dome instead of the old Salter valves. These three engines met the require-ments of the line until the turn of the century, albeit they were frequently derailed in those early years. There was room for all of them in the shed at Ballymoney, although one remained overnight at Ballycastle during the week. In 1908, however, G. T M. Bradshaw, who was also Locomotive Superintendent, designed two 4-4-2 tank engines, one of which replaced Lady Boyd. These engines - (works numbers 4665/6) were built by Kitson & Company, of Leeds, and had 14 ½ in. x 21 in. outside cylinders, fitted with Walschaerts valve gear, and 3ft. 7in. driving wheels. The side tanks were cut away above the footplate to clear the lifting link and the valve rods. The fixed wheelbase was 6 ft. 6 in., and by making the rear driving wheels the driven pair the total wheelbase was reduced to 22ft. 5in.. The weight of the engine in working order was 39 1/2 tons. The boiler pressure was 165 lb. per sq. in., and the tractive effort 15,000 lb., but full use could not be made of this power as the engines were found to be very light, and prone to considerable slipping. The engines were designed to work up to speeds of 30 m.p.h. but they were ungainly and despite their short wheelbase, were hard on the track. They were painted dark green, but details of the elaborate lining the four tank panels do not appear to have survived. They were not named but carried cast-iron number plates encircled with the company's name, on the side tanks. Much less information has survived concerning the carriage stock. In 1909, there were seven six-wheel, and three bogie coaches, one composite coach. with a guard's van and one four-wheel guard's van. The six-wheelers were delivered new for the opening of the line and three classes of accommodation were provided. There were five compartments in these vehicles. One of the bogie coaches was illustrated in The RaiIway Magazine for March, 1898. and described as "the most antique style of bogie coach constructed during the last twenty years.". Maximum carrying capacity, light construction, and ample window spare seem to have been the objects in view. There were no dividing partitions. and the lack of up-holstery was said to be best suited to the peculiar local requirements of the district in which it will be used." This coach was said to be the largest narrow-gauge vehicle in Ireland. It was 38 ft. long, and had a carrying capacity of 80 passengers. The other bogie stock was on the accepted compartment principle, and distinguished by having sides without an inward batter to the wainscoting and windows with square corners. Oil, and later acetylene gas, was the illuminant. The coaches not provided with guard's compartments do not appear to have had brakes. The coach livery was cream upper panels with dark brown lower panels and ends. Roofs were white, and the designation of the class was written in full on each door. Each coach was lettered B.R.C. At the close of its independent days, the company owned three bogie composite coaches with three classes in each, and two all-third coaches. There were also two luggage-parcel-guard's vans, which were used for braking on goods trains. The lighting of the coaches was often a source of complaint, as the gas lamps gave a very uneven light. In cold weather, first and second class passengers were entitled to foot-warmers; the third class passengers had nothing, neither did they enjoy any upholstery on the seats. Although engines Nos. 3 and 4 had vacuum brakes, the stock does not appear to have been fitted. As it was the practice to marshall the wagons between the engine and coaches, braking was somewhat erratic. The open and covered goods wagons were 14 ft. long on a wheelbase of 8 ft. They carried 6 tons, and were painted brick red and lettered B.R.C. in small white characters. The 1922 returns give 39 open, 5 covered, and 5 cattle wagons. Potatoes, sand, gravel, food, and manure were the heaviest loads in terms of receipts. Ale and porter traffic accounted for but £35. Considerable quantities of sheep and cattle were also carried. In N.C.C. days, there was a certain amount of timber traffic from a saw-mill at Ballycastle, to which a siding connection was put in. The train service averaged four trains each way on weekdays, and a single Sunday train in each direction, but though the line continued to pay it's way until the first world war, immediately afterwards receipts dropped to such an extent that on February, 8, 1924 a meeting was called to consider closing the line. Some weeks of negotiation followed, first with the Northern Ireland Govern-ment, then with the Ministry of Transport, and later with the L.M.S.R. owners of the NCC which also declined to take over the line. Services were suspended on April 4. The directors then approached the N.C.C in Belfast and were successful in getting the line re-opened. Traffic recommenced on August 11. Most passenger traffic originated either on the main line or at Ballymonev. The 1922 returns give one first class season ticket holder, no second class, and 25 third class. The change which came with the handing over to the Northern Counties Committee was drastic; there were many local residents who maintained that while they had had a railway they now had an apology for one. Control centred on Belfast did not prove popular and the dismantling of Ballcastle station was only the beginning of a simplification which was carried on throughout the years. Yet improvements also came, especially on the score of passenger comfort. Most of the signalling was removed, and ground frames substituted -passing loops and sidings were taken out. 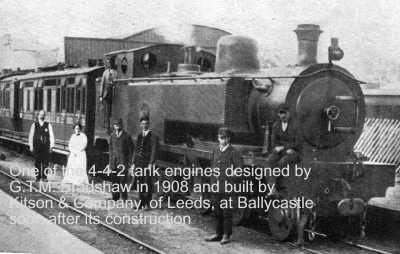 The premises at Ballymoney were pulled down, and a new concrete engine shed built at Ballycastle to house the two engines required to work the line, which now operated as one section with a special staff (when required) to allow the banking engine to work between Ballycastle and Capecastle. Thus the nerve-centre of the system moved from Ballymoney to Ballycastle. Engines Nos. 1 and 2 were scrapped at once, and the permanent way was relaid as quickly as demanded. The unsuccessful Kitson engines were sent to York Road (Belfast) and cut down for work on the narrow-gauge lines serving Lame. These became N.C.C. Nos. 113 and 114. The latter ended its days at Larne, but No.113 returned to its native road in February, 1943, and was scrapped in June, 1946. Locomotives from other N.C.C. sections were sent to the Ballycastle line, and a transfer siding was built at Ballymoney for use in conjunction with special transporter wagons, which up to then had only been used for transfer on and off the Larne and Red Bay lines at Ballymena. Eventually, all N.C.C. narrow-gauge types, except the Beyer Peacock 2-4-0 and 2-6-0 tank engines, worked the line, and finally the 2-4-2 two-cylinder compound tank engines were left in sole charge, as the Ballymena lines on which they had worked were closed and dismantled. The final allocation was N.C.C. Nos. 41,43, 44 (recent renumbering). Two of these were shedded at Ballycastle, and this allowed for the third to be away for heavy repairs. A second engine was in steam for banking purposes. The engines were coaled at Ballymoney from wicker baskets, and had to run there for this purpose. Repairs were carried out in the rear pit at the shed. Before the line was closed, No.41 appeared in U.T.A. livery - the other two engines were still lettered N.C.C. and had the coat-of-arms on the cab sheet. After the Ballycastle Company ceased to exist, improvements were made in the coaching stock. Trains were marshalled so that goods stock was in the rear of the coaches, and, as the Larne lines were closed to passengers, the redundant bogie stock was transferred to the Ballycastle Section. These coaches had corridors and lavatory accommodation, and though the latter was removed at the same time as the corridor connections, they still re-main the last word in narrow-gauge coach design on a British railway. On the Larne lines they had run in the boat train from Ballymena to Lame. Steam heating, electric light, and vacuum brakes were fitted. The interiors varied slightly; one coach had an open saloon section. In addition to these two coaches without lavatory accommodation were built specially for the section. It is hardly necessary to add that the original stock soon disappeared. Mixed trains were run to the last, and two goods-type four-wheel vans, with guard's accommodation, were added to take parcels and goods traffic, though sometimes one sufficed. So great was the traffic on Lammas Fair Days (the last Tuesday in August; that one coach from the Red Bay line was reprieved and stored in Ballymoney carriage shed for use at this time. This had end gangways and perimeter seats. There was a single interior partition. Two other coaches from this line were in use as camping coaches at Ballycastle. The schedules allowed for shunting where necessary, and 50 min. was the recognised duration of the run. At one time, there was an express to connect with the 12 noon, Saturdays only, Belfast-Portrush train. It ran non-stop from Ballymoney to Ballycastle in 42 min. From the early 1930s, bus competition began to make itself felt. Fortunately, the bus services were not running in com-petition with the railway, but to supplement the train service. After the forma-tion of the Ulster Transport Authority on October 1, 1948, however, direct com-petition began, and the Sunday train gave way to a bus in winter. With the U.T.A. already closing down sections of railway (notably in Co. Down) it came as little surprise when the Ballycastle section was listed among lines due for complete closure on July 3, 1950, following a preliminary announcement in the pre-vious January. No formal objections had been lodged against closure, and the last trains ran, as announced, on Sunday, July 2 (there were two trains each way on Sundays in summer). The last up and down trains ran double headed. No. 41 piloting No. 44 in one direction with four bogies and two vans, and on the final run to Ballycastle with two coaches and two vans. The line has laid derelict since the train services were withdrawn, and it seems unlikely that it will be re-opened. The two locomotives and the rolling stock have been stored at Ballycastle, awaiting developments, but one bogie coach was delivered to the County Donegal Railways Joint Committee, and received at Stranorlar on August 20, 1951. The heights of the buffers and the couplings are to be adjusted for use on those lines. In conclusion, the writer wishes to express his thanks to Mr. H. A. Boyd, of Ballycastle and Mr. T. M. Hutchinson the Stationmaster at Ballycastle, for much local information; to Messrs. E. M. Patterson and D. B. McNeill, who offered notes and photographs and to Mr. H. Fayle, for reading the proofs of this article.